I have been a huge fan of the Liz Earle Cleanse & Polish for as long as I can remember. Both my mam and nana have used it since I was a child and have encouraged me to use it from around the age of 10/11 when I first started playing around with make up - I'm not talking full face more eye shadow than anything else. The product itself is lovely and creamy and a little definitely goes along way - I use around 2 pumps every evening when I remove my make up starting at the centre of my face and working outwards. The cleanser successfully melts away all traces of make-up and then all that's left to do is use your muslin cloth to cleanse and exfoliate the skin. I then follow with the Instant Boost Skin Tonic and the Skin Repair Moisturiser (I'll review these in the next few days). The ingredients include Chamomile, Rosemary, Cocoa Butter and Eucalyptus Essential Oils all of which have never irritated my skin or my eyes - you can open your eyes with the cleanser on and there is absolutely no irritation. One of my favourite things about this product is the smell, it isn't overpowering like a lot of skin products but is instead light and refreshing. I have used this cleanser for so long now and refuse to try anything else as I am just too much in love with it! 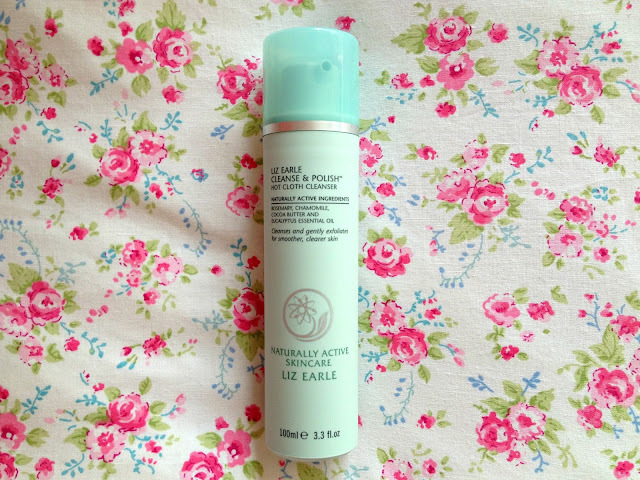 If you would like to give Liz Earle's Cleanse & Polish a try you can purchase a 100ml bottle from her website for £14.75 or you can purchase Liz Earle products at John Lewis and QVC. However, if you are new to Liz Earle, I would highly recommend getting the Skincare Essential Kit which includes a full size Cleanse & Polsih, Instant Boost Skin Tonic, Skin Repair Moisturiser and then an extra item which changes each month all for £43 with free P&P! AMAZING! Absolutely second your love for this cleanser, I can't ever see myself changing from it!